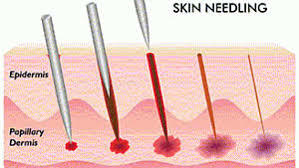 The treatment involves dry needling of affected areas of the body without injecting any substance. The needle sites can be over tight muscle bands or can be near the spine to release tight deep paraspinal muscles. Penetrating of a needle into a normal muscle is painless; however, a supersensitive muscle or shortened muscle will grasp the needle in a way that can be described as a cramping sensation. This sensation only lasts for a short time and a feeling of muscle relaxation is often felt immediately following treatment. In effect, IMS treats the underlying neuropathic condition that causes the chronic pain. When properly and completely performed IMS has a remarkable success rate.